Before you read any further, please visit Etienne Bonduelle's page on the 'Easy' RAW mod for Philips Webcams. There is also a tutorial in French, "Conversion du RAW couleur".... and even one in Turkish! What is the RAW modification? Essentially, it is a firmware modification that allows elimination of the usual in-camera processing that all webcams perform. Such processing causes loss of image resolution. With the RAW mod we can capture the information directly as seen by the CCD. But to use such RAW image information, we need special software. This is where AviRaw comes in. AviRaw can reconstruct the colour information in a way that does not cause so much image resolution loss, and it can convert the RAW avi into normal AVIs that can be processed by the well known processing programs (IRIS, K3CCDTools, Registax and several others). 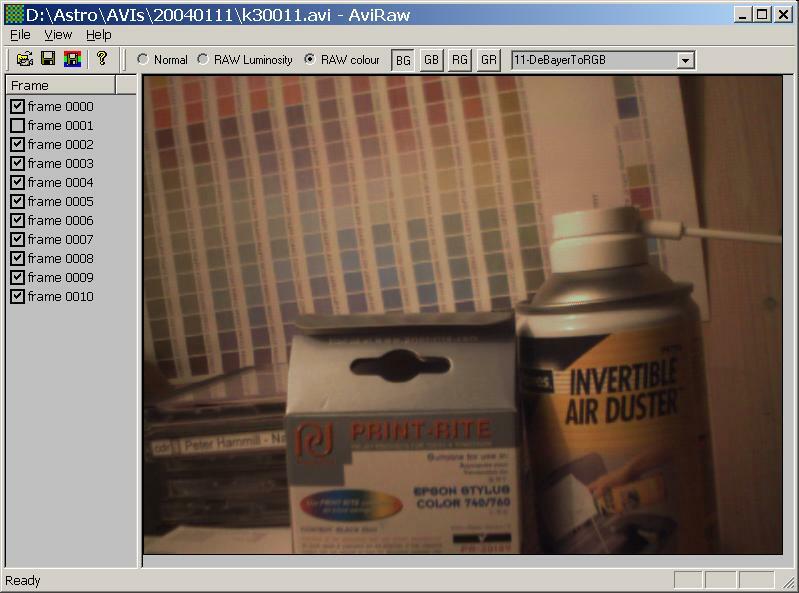 drag & drop support of AVI files into AviRAW. recent files in the File menu. Legal notice: All information and software in this page is Copyright (c) Carsten A. Arnholm. You may freely download and use the software for non-commercial purposes. Contact the author for permission prior to using the software for other purposes. Disclaimer: The author regularly uses the software on several of his computers and firmly believes that the software is without any damaging effect. Nevertheless, the author accepts no responsibility for damages resulting from use of the software and makes no warranty or representation, either express or implied, including but not limited to, any implied warranty of merchantability or fitness for a particular purpose. The software is provided "AS IS" and the author does not assume or accept any risk by its use. Check/uncheck frames in list and save only checked frames. To use the RAW features, a Philips webcam format is assumed. AviRaw supports both Vesta and ToUcam style RAW cameras. Select one of the Vesta or ToUcam options in the toolbar combo box. This has been tested successfully on RAW Vesta and ToUcam cameras (both with colour CCD chips). AviRaw decodes the so-called bayer-pattern in the images captured with RAW-modified colour webcams. It does this by by-passing the AVI codec that is normally used to create a colour image. The CCD color sensors have small R,G,B filters over each pixel in order to be able to represent colour variation. Each pixel has only one colour (red, green or blue), and the layout of the filters is called the "bayer pattern". We can identify the 4 variants after the two upper left pixel colours. The BG, GB, RG and GR buttons are in AviRaw used for selecting which bayer pattern layout variant shall be used when reconstructing a complete colour image. It turns out that with RAW modified webcams, you don't always get a consistent layout result (even with the same camera), so it is convenient to be able to select all possibilities. In addition to selecting the bayer pattern layout, you select the debayer algorithm to properly interpolate values to create a complete RGB value for every pixel, and then you have a completely reconstructed colour image.